CENTURO is a nitrification inhibitor that growers can now use with anhydrous ammonia to help protect against nitrogen loss from leaching or denitrification. Nitrification inhibitors are an important tool for protecting applied nitrogen and keeping the valuable nutrient available in the root zone in the ammonium form where it’s less susceptible to loss. 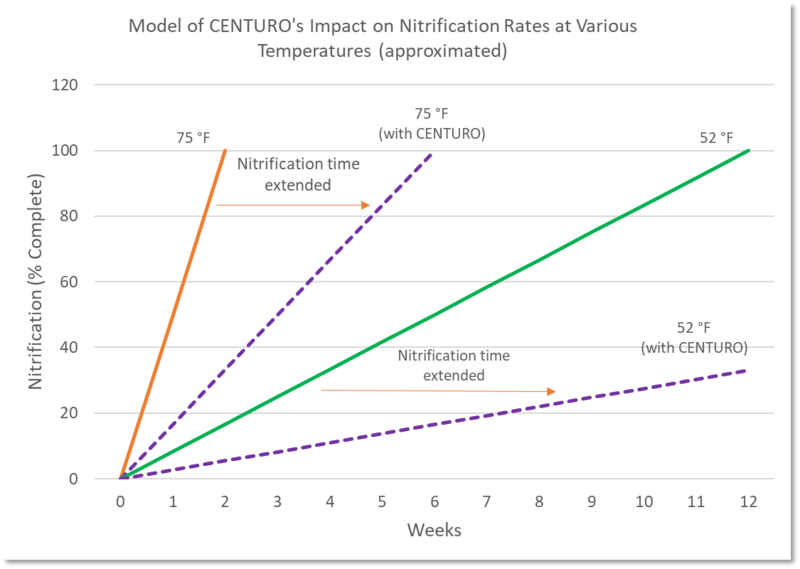 By slowing the conversion of ammonium to nitrate, CENTURO, as shown in the graph below, can hold nitrogen in the ammonium state three times longer than untreated ammonia1. With fall-applied anhydrous, more ammonium will be held in the soil through the spring, maximizing availability for crop uptake. By keeping more nitrogen available for plant uptake, research has shown CENTURO can improve nutrient-use efficiency and yields. Using CENTURO also follows the recommendation of the 4R Nutrient Stewardship Initiative, by keeping nutrients available when crops need them, and where the crops can use them. When it comes to protecting fall-applied nitrogen, don’t leave it to chance – protect your investment with CENTURO. To learn more about CENTURO, visit CENTURO.com or contact your KAS rep.
For the timing of NH3 fall applications we recommend following university extension best management practices. As fall fertilizer applications start, remember to visit our top four tips for fall nitrogen applications by clicking here. 1The underlying data is based on third-party laboratory studies funded by Koch Agronomic Services; results may vary based on a number of factors, including environmental conditions. CENTURO is not registered for sale or use in all states. Contact your state pesticide regulatory agency to determine if a product is registered for sale or use in your state. CENTURO™ and the CENTURO logo are trademarks of Koch Agronomic Services, LLC. Koch and the Koch logo are trademarks of Koch Industries, Inc. © 2018 Koch Agronomic Services, LLC.